Some days are soul food kinda days – to cook and to eat. Cooking with potatoes totally fall into this category irrespective of the cuisine you are getting into. Potatoes are the epitome of comfort cooking across the world. 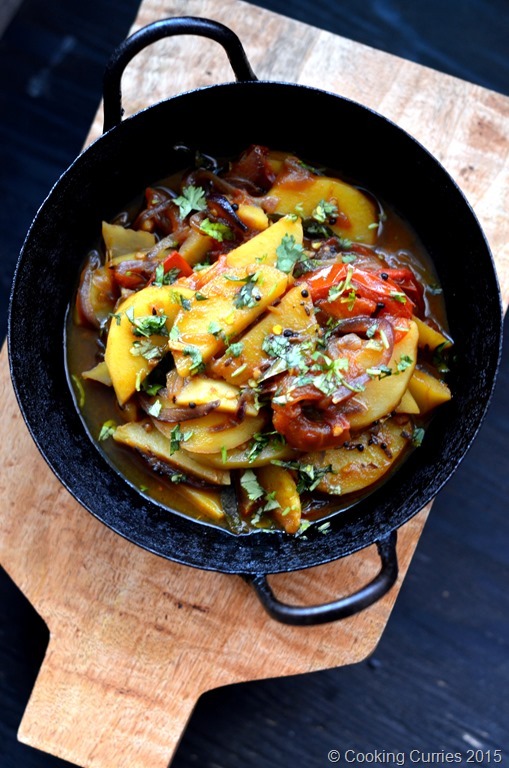 A good simple potato curry that is lightly spiced with green chilies and ginger along with a touch of sweetness from the onions and a little bit of tang from the tomatoes perfectly rounds up the concept of soul food to me. What does soul food or comfort food mean to you? Is it something that you cook when you are down and need a little bit of cheering or is it something that you crave often or is it just something that has a whole lot of memories attached to it? Or maybe it is just something, anything you make with that one comfort ingredient. Whatever it is, think about it if you don’t remember it right away or find out what it is and make a note of it. Trust me, some days are soul food kinda days and these kind of food can do magic to your days when you need them the most. For this potato curry, I tempered some cumin, mustard seeds in oil and added some ginger, garlic, green chilies and curry leaves for flavor. The thinly sliced onions were then lightly browned along with some tangy tomatoes. In went some potato wedges after that to simmer along with some water added to the mix, till the potatoes were just about cooked. Some salt, black pepper, cayenne and more cumin powder to add more last minute flavors and topped with minced cilantro is what made this simple potato curry to be such an elegantly rustic dish with so much elevated flavors but still being very close to the heart and the soul. 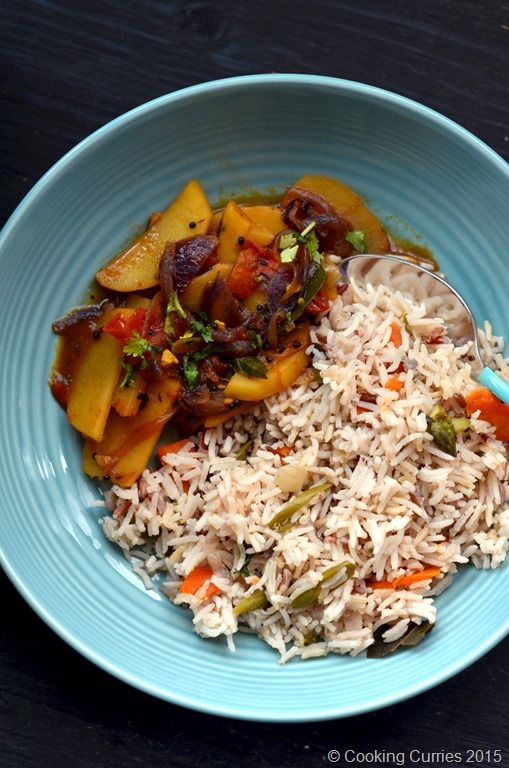 I came across this picture of a potato curry on Instagram from Shweta in the Kitchen and I absolutely fell in love with how the potatoes were cut in wedges in the curry. I always cube or roughly mash the potatoes in any curry I make with them. The wedges gave a totally different dimension and look to the curry and I wanted to make some of my own. 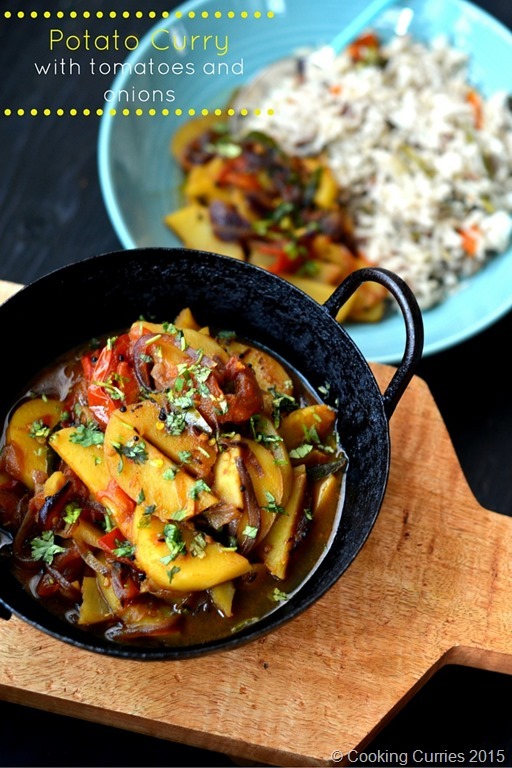 I looked at her recipe and though it was very similar to how I make a potato curry, what attracted me was that she added asafetida to the mix. Spices like cumin, carom seeds and asafetida are added while cooking lentils and potatoes as they help better with digesting them and work as an anti-flatulent agent. 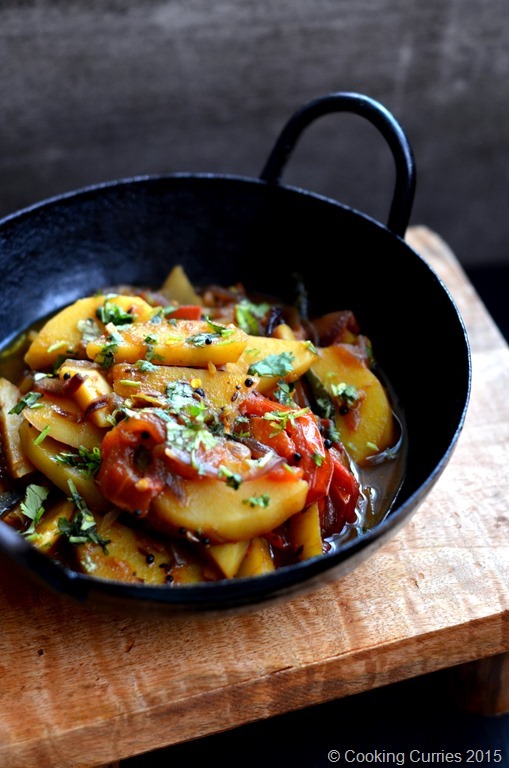 Even though I add asafetida to a lot of lentil curries, I have never really used that in a curry with potatoes and I was very excited to try that. The resulting burst of flavors was just amazing, to say the least. In a kadhai or a heavy bottomed wide pan, heat the oil over medium heat and add the mustard seeds. Wait for them to splutter and add the cumin seeds, asafetida, green chilies and curry leaves. Give it a quick stir and add the garlic and ginger as well. Toss in the onion slices and saute over medium high heat till they brown a little. Add the tomatoes, cumin powder, cayenne, salt and pepper and let the tomatoes soften a little. Now add the potatoes and water and cook over medium heat till the potatoes are just done. Garnish with the minced cilantro and serve with rice or rotis / chapatis or even toasted bread. Faith – thank you! You can omit ginger if you want to. It will still taste pretty good! Yum Yum! wanna reach those potatoes through my laptop screen! ?? thanks Shadi! Remember, you are welcome home anytime to taste some in person! ? I like curries on a cold day. The spices warm me up from inside out. Oh yeah! they sure do. Unfortunately, the stomach is no longer up to par! Sure, Michael. You can always skip the chilies and the cayene and try with just the cumin and a little bit of black pepper. It will taste different but it will still be good. My family loves potato curry. I usually make it in a different way. Will try your way too. Sure. I would love to know how you make it. Maybe its in your blog? This looks delicious! I can’t wait to try it. I’m always looking for different ways to eat potatoes besides baking them tossed in some olive oil or in a hash. The only thing I’ve never had or even heard of is powdered asafetida. Going to have to get some! You can easily find Asafetida in any Indian / Pakistani stores in your neighborhood or buy them online on Amazon – http://amzn.to/1VnFN6h Use a little at first, its pungent and takes a little bit of getting used to. Make sure you dont burn it, otherwise it kinda lets out a bitter taste. I made curry chicken tonight! This would be a great no meat option for my family. Where can I find asafetida? Is it sold in international markets? I’m saving this recipe to my Pinterest. Thanks for sharing! This looks so scrumptious! I love curry potatoes never thought to add tomatoes. I know my family will love this recipe, thanks for sharing! This looks divine! Can’t wait to give it a try. Thank you Sarah! I hope you love it! This looks SO delicious! You’re pictures are beautiful. Thanks for sharing this recipe.